I have a problem with reels strip on my Mills ! It’s an complete ,unrestored and untouched Extraordinary ,in French version (1Francs) ,front vender ,no gold award , 10 STOPS ;but no reel strips ,no award card ! SN 3989** . The problem: It’s a very strange bundle ! Disk are :FR1;Fr2;FR3 ,in 10 stop ,with 4 rivets and not 3 as the early version ! FR for “FRuit” or “FoRtune Teller” or other ?? I have not found any info on this !! And the reel 3 are very special ! Just one hole for the bell ,so you can win 3 coins only for “Cherry,cherry,Bell” not 5 !And two stop with “no hole” ! Maybe for a new symbol like a Pear. This is a scan of the three disk! And a test of strip that I mind, and award card! Tell me if I’m in the good way, or if you have any info about this strange Bundle ? !Please HELP ME !! I hope that my English is not too poor ! !Sorry for this !! The reel strips with the fruits and bars on them will not work. the first three reels strips with the symbols on them should work. The Yellow triangles have no hole so they are the same as a Lemon. Should have no payouts if a yellow triangle is present unless it pays on one or two reds and the yellow triangle is on the third reel. Last edited by oldslotman on Tue Jun 16, 2015 1:14 pm, edited 2 times in total. There were those strange "fortune only" strips that came in 2 varieties; one with the fortunes in a shield shape, and the other with the fortunes printed over colored squares. I have seen them on extraordinary machines years ago. Could these possibly be the strips for these discs? I know that the “no fruits” symbols was on the first extraordinary model ! -Oldslotman ,sure , If I use your award card style ,this solution work, it s a good idea ,even I’m not sure that is an Original Mills Solution ! Or maybe a special card like the QT !? This is a part of a Mills catalog, with a zoom on the award card! It’s a conventional award card but without Fruit symbol . And another strange info that we can see on this photo ,I think that there are only 10 symbols on each reel strip !? No ?? 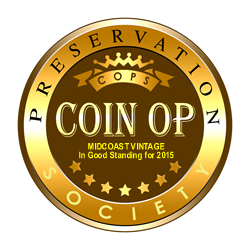 -Midcoast vintage , I see that you think .It’s the same than the reel strips on the Jennings “today vendor” !No? But as my extraordinary was for the French market , all papers was in French ( the paper on the back door and front information! )! 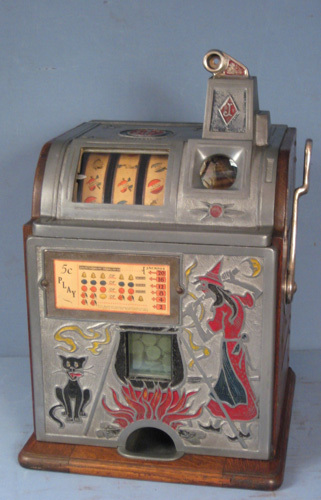 So , impossible to find a “fortune teller “ in English on this slot , and never never seen “fortune teller “ in French on any Watling ,Mills ,Caille or other slot machine! Thank you ,thank you so much for your help ! Disregard the single red payout and have an award made. Should work. Last edited by oldslotman on Tue Jun 16, 2015 1:15 pm, edited 1 time in total. You could use the fruit reel strips if you drilled a hole for the bell in the cherry position on the third reel strips. - I keep fruit symbol , with a Pear symbol on the reel 3 and this award card (pay 3 for cherry cherry bell !) !But I m not sure that the Pear was a Mills Symbol !I know that Watling use it ,but not sure for Mills ! - or I use the other symbol with this award card ,but look as a very very strange award card ! What do you think about the best and realist way ?? I would do the second award card. You would not have to drill the disc. I just wouldn't like that pear. I just think that award card looks nice, plus you are not changing that third reel disc. I m Back with my strange Extraordinary ! I have not drilled the disks ,I kept the "symbols" solution !